The 2017 Spring Stormwater Symposium brings together professionals from both public and private sectors to learn from local, regional and national experts. The Symposium will focus on examples of stormwater program funding & management, and also dive deep into the life cycle of a successful stormwater management project from a team that made it happen. The Symposium is a collaboration of the University of Nebraska-Lincoln, the Nebraska Floodplain & Stormwater Managers Association (NeFSMA), and the Great Rivers Chapter of the International Erosion Control Association (GRIECA). Supporting sponsors include: UNO Center for Urban Sustainability, the City of Omaha Stormwater Program, Douglas County Environmental Services, and Nebraska H20. Regional Water Quality Trading - Seth Brown, President of Storm and Stream Solutions, Inc.
Seth Brown, President of Storm and Stream Solutions, Inc.
Are you a member of the design, development or construction community? Are you interested in ensuring quality sustainable growth in your city? Do you want to learn how to turn a "waste product" into a resource? This symposium is for you! Architects, citizens, developers, engineers, government officials, landscape architects, landscape designers, students, researchers, teachers and all others interested in the broader acceptance of interdisciplinary design approaches critical to successful LID are encouraged to attend. Click here to secure exhibitor space. For additional sponsorship opportunities and group rates please email iecagreatriver@gmail.com. In the September issue of Stormwater, the City of Omaha's green infrastructure projects of their CSO program were featured. Several members of NeFSMA were quoted in the article. Congrats to Nina Cudahy (City of Omaha), John Royster (Big Muddy Workshop), Katie Pekarek (UNL Extension), and Steve Rodie (UNO) for the national recognition of the great work you're doing! 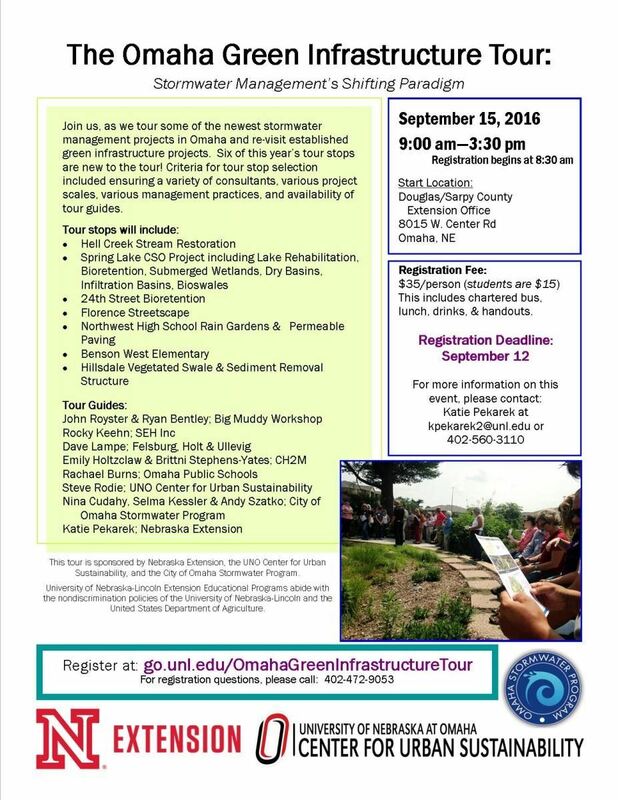 Registration is now open for the annual Omaha Green Infrastructure Tour. One of NeFSMA’s core goals is to promote public awareness of floodplain and stormwater management. We are looking for volunteers from the NeFSMA community to help accomplish this important goal. We currently have three opportunities available for volunteers to help demonstrate NeFSMA’s floodplain model. We are looking for 2 to 3 volunteers to fill each available time slot. This is a very fun and rewarding way to help educate our community about floodplains. Time Slot #1: 9:00 A.M. – 12:00 P.M.
Time Slot #2: 12:00 P.M – 3:00 P.M.
Time Slot #1: 5:00 P.M. – 8:00 P.M.
Training on the flood model demonstration can be provided. If you have any questions regarding this opportunity, please contact Mike McIntosh at 402-496-2498. The University of Nebraska at Omaha Center for Urban Sustainability is hosting "Accelerating Innovative Urban Ideas in Water" a panel discussion about current critical regional water issues and how to address them. You are invited to participate in a conversation with state and local water experts to discuss challenges and opportunities relevant to urban sustainability. Meet with other attendees to enjoy complimentary food and drinks, and participate in a dialogue on water quality, availability, policy, politics, and citizen engagement. In addition, this will be the LAST EVENING that the Kaneko Water Exhibit will be open. This panel discussion will be held on April 22, 2016 at The Kaneko, 1111 Jones Street in Omaha. Have you been considering ordering a NeFSMA shirt? Well, now's your chance to order and save. We will be putting in a group order at the end of January for a 15% discount. You can see all the items we have to offer here. If you're interested please email Rocky Keehn at rkeehn@sehinc.com with your choice and size by January 29th. It's hard to believe that 2015 is almost behind us. It's been a great year for us and we hope it was for you as well. As we start to prepare for the new year, we are looking at doing a few new things. One will be a 2016 photo contest. We're looking for the best pictures you can send of your projects. No project is too small, no flood too large. We want to see Nebraska and our members at their finest! At the end of the year, we will choose the best photos to feature in a wall calendar to be available at our Annual Membership meeting in November. Photos can be sent to nefsma@hotmail.com throughout the year. If you submit a photo, please provide a brief description of the subject, the names and professional affiliations of any persons in the photo, and the name and affiliation of the person who took the photo. We want to wish you all a happy and safe holiday season and we can't wait to see what our members will do next year! The Lincoln Journal Star was in attendance at our Annual Conference on July 30. Here's a link to their write-up of our Keynote Address discussing the May 7, 2015 flooding in Lincoln. Flood control dams did their job; four lakes set record storing May storm. There have been a lot of flooding events in Nebraska over the last year. And we know our members always have awesome projects in the works. If you have some high-quality pictures of flooding or a new project that has been installed, or even an old project that's working well, we want to feature them at our upcoming Annual Conference! These must be your original photos and by sending them you are giving us permission to display them publicly. Please send your photos to Lori Laster at llaster@papionrd.org along with a caption describing the photo, the names of any people featured in the photo, and the name and employer of the person who took the photo. They must be received by July 24 to be considered!